It wasn’t a bad idea and just the suggestion alone brought back a reverie of names such as “Uncle Sals’ Ribs and Bibs,”(Southern (Bronx) BBQ), Tandoori Hut, (Dining With Sikhs) Cafe Gelchick (Kvass and Vodka), and the long defunct Peruvian gem on Northern Boulevard, La Pollada de Laura, home of the legendary “leche de tigre” (Cooked in Corona). 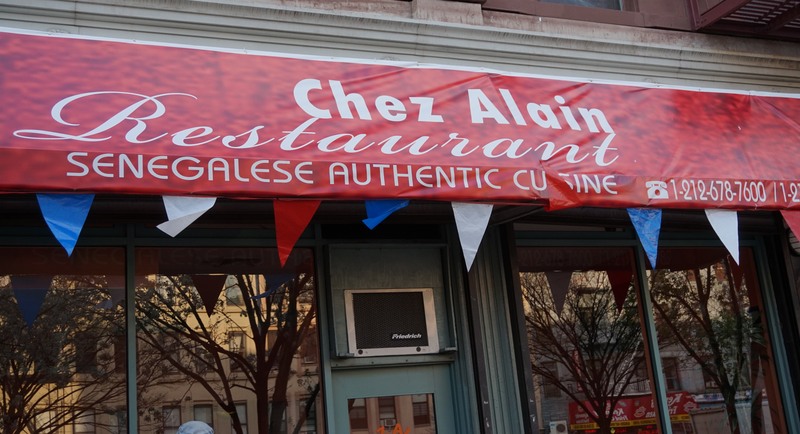 I had stopped by Chez Alain the day before our meal to talk to the hostess who introduced herself as Marieselle, making sure she would reserve our table for five and that all the dinner specials would be available by the time we arrived in the evening. Many of the African restaurants do a very brisk lunch and afternoon business catering to taxi drivers on their breaks before the evening rush. As a result, often all the good offerings are gone by dinner. I did just that so when we arrived at Chez Alain, Marieselle reassured me that the she had the thiebou djenn for me. Thankfully, Gerry veered from the fish fest to order the lamb version of thiebou djenn. For some reason, Eugene’s fish arrived first. 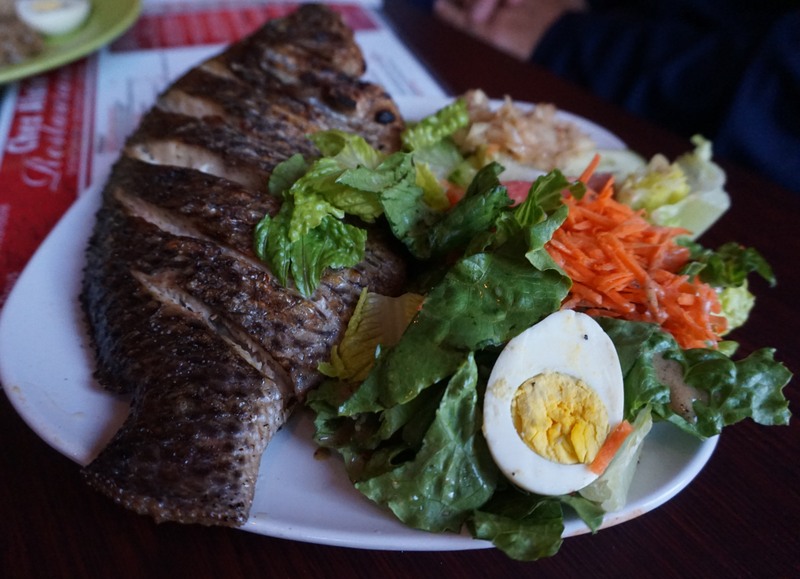 A monstrous tilapia, its skin seared into slices and grilled to a crusty brown. “Is this one all mine?” Eugene asked incredulously. When he saw Zio and Mike from Yonkers get the same size fish delivered to their seats he had his answer. 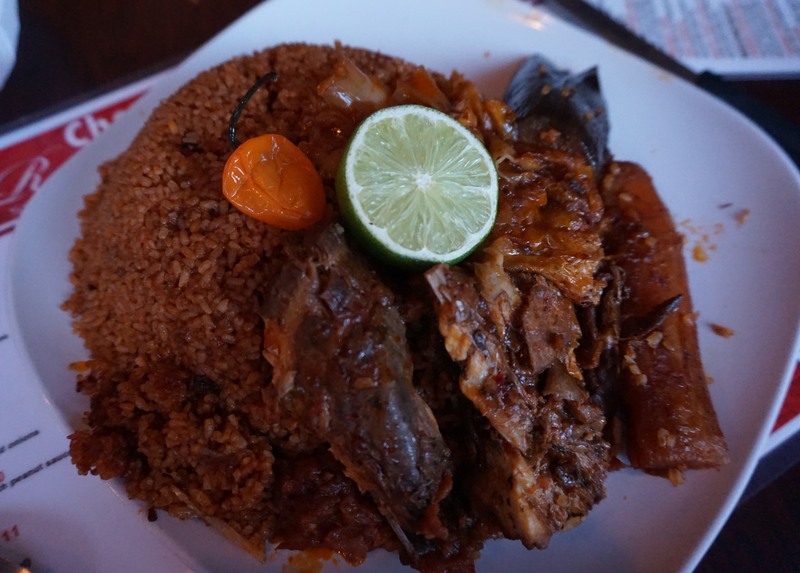 Finally the much anticipated thiebou djenn arrived; the short grain rice cooked in a peppery tomato sauce with chunks of fish layered on top along with eggplant and root vegetables. After a few bites there was no doubt in my mind that it was worth of reserving a day ahead. As I happily devoured the thiebou, I watched the three of our group dissect the grilled fish. Eugene neatly excised the tender, moist meat from the bones and Mike from Yonkers, as is his custom, took his time in making sure not a piece of the favored cheeks and/or any other speck of fish remained. Zio, on the other hand, made no attempt at decorum. His fingers, coated in the oils of the fish, were his utensils of the night. His plate was a quagmire of skin, meat and bones all of which, whether he wanted to or not, he shoved into his mouth. But from the determined look on his face, despite the disaster that was his plate, no one would deny him the pleasure he was having by criticizing his methods. “This one just might make our Chow City Hall of Fame,” Eugene declared to all as he finally put his fork down, his fish now just a bony carcass. And with my plate cleaned, I couldn’t disagree at all. After having settled our bill, well under our $20 per person allotment, and on our way out, Marieselle told me that if I wanted the thiebou to call and they would always save an order for me. Being only a few blocks away from the northern border of the Senegalese Stomping Ground, that was more than a comforting thought.